One of my favorite movies is Guardians of the Galaxy. I still remember sitting in the theater in total awe of the ship that Peter was flying, the Milano. I knew that if LEGO ever came out with a set that I HAD to get one! 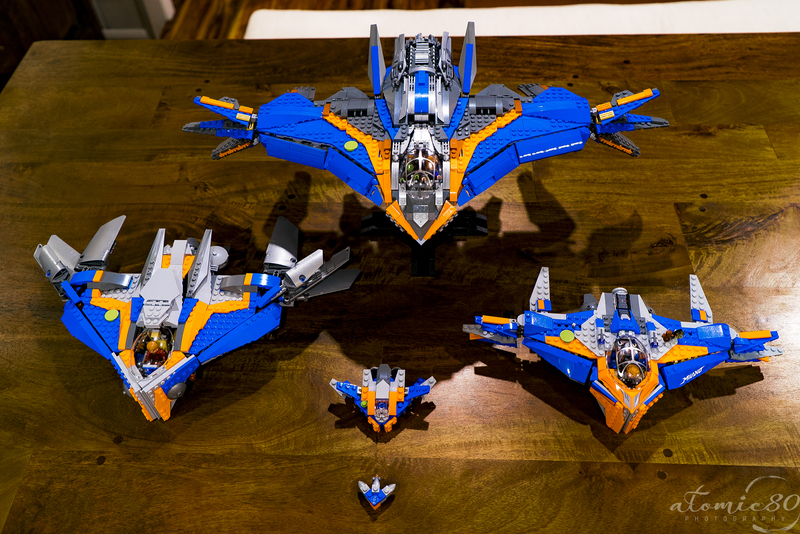 And then..there was more...and more...and then Tyler Clites revealed the UCS sized version. OMG....now that's a build. So, when LEGO came out with set 76081 after the release of Guardians of the Galaxy 2, I got one...enjoyed the build. I hadn't realized that they came out with a larger build for the original movie, set 76021 which for some weird reason has bright orange accents instead of orange. I also picked up the mini Milano too. After that, I found the instructions for the UCS by Tyler Clites. I decided to go for it and shortly after that, I found the micro sized version also by Tyler Clites. I decided to replace the bright orange pieces on set 76021 with the proper orange accents as well as modify the windshield to match the others. And so, this is the result of my madness! The only thing was that I wasn't able to put the lime green "accent" piece on the micro version because it wouldn't fit without making contact with the other "claw" pieces. Any suggestions on what to do there? That UCS one is amazing. I looked for that person's contact info to get the plans but never could find them. Do you have a link? I did the same thing with the original Milano and replaced all the yellowish orange pieces with the regular orange, looks much better that way. One thing though..it was kinda tricky finding all the parts since the parts list that they sell isn't too clear. Let me know if you have issues and I'll try to help. How much did the UCS one cost you? About $200 for all the parts.